The first Indian American elected to the U.S. Congress in 50 years talks about his motivations, Christian faith and Indian roots. He’s only 33 – the age when most people are still pondering career choices or fretting over the ones they’ve made. Yet Bobby Jindal is already a U.S. Congressman, the first Indian American to achieve that title in nearly 50 years. . And he didn’t merely win, but won in a huge landslide, capturing 78.45 percent of the vote, besting even President George Bush in his district. Jindal’s is the classic American success story. His parents immigrated from New Delhi to Baton Rouge in 1971, where his father was a civil engineer and his mother studied at Louisiana State University, getting a degree in nuclear physics. 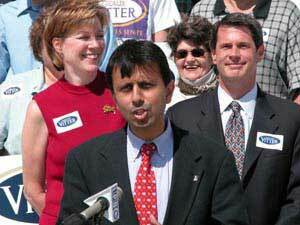 Jindal was born in Baton Rouge and grew up in the diverse neighborhoods that surround the university. He graduated from Brown University with honors in biology and public policy and was also a Rhodes scholar, securing a graduate degree from Oxford University. You can almost trace the trajectory of his rising star. A consultant for McKinsey & Company, he served later as Secretary in the Louisiana Department of Health and Hospitals. He went on to become the executive director of the National Bipartisan Commission on the Future of Medicare. Then at age 28, he became president of the University of Louisiana System. And after that, he was appointed by President George W. Bush as assistant secretary for planning and evaluation for the U.S. Department of Health and Human Services. 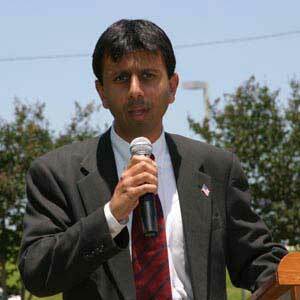 Jindal has always set high stakes, such as running for governor of Louisiana last year. This young Republican almost won, narrowly losing the race, proving that he’s a very viable player in American politics. He took lessons from his loss and used them as stepping-stones to his astounding victory this year, beating three Democrats and a Republican who were all running against him in the congressional elections. 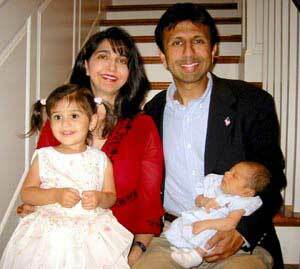 Jindal and his wife Supriya both embraced Christianity and are Catholics. They have two children, Selia Elizabeth and Shaan Robert. 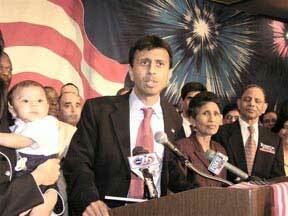 While many Indian Americans have proudly claimed Bobby Jindal as their own, if you follow the thread on various list servs, you also get the sense that some in the community feel that Jindal hasn’t totally embraced his Indian roots or that perhaps his decision to convert to Christianity may have been a politically expedient one. Jindal also holds strongly conservative positions on abortion and other so-called wedge social issues, putting him at odds with the Indian mainstream. Fresh from his stunning electoral victory, Congressman-elect Jindal talked with Little India about everything from his childhood his college academic interests to outsourcing. Could you tell me how you felt when the numbers were coming in and you knew you had won by a landslide? Well, we were certainly thrilled to win, but we were thrilled to win by the margin as well. We actually won by 78 percent of the vote. I think, did better than anybody who was running that night in Louisiana. We were honored because we got support from Democrats, Republicans and Independents. We were very grateful because many, many people had worked very hard to help us get there. Many people went door to door, made phone-calls for us and we are just really grateful for that support. What kept you going through the campaign because nobody can foresee what’s going to happen and you had three Democrats and a Republican running against you? I think for me the important thing was being able to make a difference, to be able to give something back. My parents came here from India obviously and they came here so my mom could go to school and my dad could get a job and they’ve taught my brother and me the importance of giving something back to the community, the importance of pursuing that American Dream. I wanted to make sure those opportunities continued to exist for my children. So what motivated me was I saw the opportunities that brought my parents here and I realized I wanted those same opportunities – the same good schools, the same good jobs to be there for my young children and for all of our children. We worked very hard; we had dozens of volunteers, literally a couple of hundred volunteers, who worked very hard for us everyday. So I was very grateful to them and it was certainly inspirational to me. So there was obviously something you were able to touch in all these volunteers, that they followed you in what you were doing? It seems quite amazing that in the South, in Louisiana, you were able to win by such a landslide. It probably says something about your constituency also. Absolutely. I’ve always said that my voters here in Louisiana were more interested in the issues, that they were very much interested in electing whoever they thought would do the best job. I think that they proved it on election night that it wasn’t about personalities, it wasn’t about anything other than which candidate they thought was most qualified, who had the best experiences, the best ideas to represent the district. The issues that you ran on – to create economic opportunities, lower taxes and make health care more available – isn’t that something the whole country needs? Absolutely. Certainly my first obligation is to the voters of the first district, but the issues that I care about are very, very relevant to every American. Every working family has to worry about the cost of healthcare; they have to worry about the issue of creating jobs. Before this was your run for governor. What did you learn from that loss? What we learned is that it’s so important to focus on the issues. We stayed positive last year. We stayed focused on our solutions for the problems facing the state and I think, the voters rewarded us for that, because we did better than people thought we were going to do in the primary. The most important thing to do is to talk to as many voters as possible. So I tried to do door to door visits, do the back porch conversations, do the phone calls and letters. I tried to talk to as many voters as possible and that I think increased our chances of success. What do you hope to accomplish as a congressman, and what are the committees you’d like to be on? I certainly want to draw upon my experience in health care. I’ve worked on that at the state and federal level so I’d like very much to be a part of making healthcare more affordable for working families, that includes Medicaid hreform as well as looking at Medicare and private insurance as well. That’s going to be challenging. There are so many people including Indian-Americans, who are without health insurance right now. Absolutely. I think it’s the number one domestic issue facing our country in terms of the rising cost of healthcare. America has a very good healthcare system. We have to make sure that it remains affordable for working families. There are also tax credits and association health plans that help small businesses afford health care. You are inheriting the mantle of the first ever IndianAmerican Congressman Dilip Singh Saund. So how do you view your historic role for the community? I am very, very honored by the well wishes and support from the Indian American community. I guess the reason I ran for office in the first place is that I saw my parents experiences in this country and I’ve seen the example they set at home: the importance of work and education. I want to make sure that the opportunities that brought our parents here in the first place continue to exist for the second, third and fourth generations as well. So I think that certainly I feel that I’ve got a role to play in making sure that those opportunities exist but I’m very aware of the tremendous support I’ve received from the Indian American community and the responsibility that goes with that. So you do feel in a way responsible for the Indian-American community? Well, I certainly want to do the best job that I can. Obviously I’ve got to represent the voters that are allied to me, but I think there are many issues that are important to Indian-Americans that are also beneficial to voters in the First District. So I don’t think there is a conflict there. There are so many Indian Americans who are Democrats. How do you answer people who feel that that is the party of the immigrants. I think it is a good thing for Indian-Americans to get involved with both parties. I don’t think that we should all be either Democrats or Republicans. I think both parties have aspects that are attractive and as you see more Indian Americans get involved in politics, you’ll see more Indian-Americans in both parties. There are several prominent Indian American Republicans in the administration in the local level. I think that’s a good thing. Historically there have also been very many prominent Indian American Democrats. That’s just a hreflection of the diversity of the community. I think that’s a very good thing. Immigrants have to adjust to America and become a part of it. But what are aspects of your culture or your roots that you have retained or are precious to you? Every family makes those decisions and obviously there’s no one right answer. Families make different decisions on language and food and things, and I think that’s a very personal decision and it’s unique to each family. I’m married to an Indian American woman whose parents came over about the time mine did and so our heritage is certainly an important part of how we are raising our children and forming our family. But again, I suspect every family will have a different answer to that question and that’s normal, that’s the way it should be. Certainly in our own family even there there’s a wide range of things. My mother-in-law certainly watches Indian movies and listens to Indian music. So I think there is a wide range of applications. How important has the financial support from the Indian American community been to your political aspirations. Well, we certainly very much appreciated the support. It was a small percentage of the funds we raised this year, but we are still very grateful for that support because many of the Indian American donors came from outside the state and we certainly appreciate their supporting my candidacy. I think it’s important that candidates raise the majority of their funds within their districts, within their states, because you have to have that local support to be a viable candidate and so as a percentage, it was a small part of the money we raised this year, but we are very much grateful for that support. Some media outlets have said that almost a fifth or a quarter of the funds raised came from Indian Americans. I don’t know where those numbers came from. We have never specifically tabulated it, but I think it would be much less than ten percent. You think it’s more the moral support, that you know that everybody is rooting for you? I think that’s right. Again, we certainly appreciate the support we’ve received. I think I’ve seen the same media hreferences you were mentioning, but I don’t think it was anywhere near that high. I think in general India supplies not only to outsourcing but to free trade as well. I think international trade can be a very good thing not only for America, but for the country it trades with, including India as well as other countries. As long as there’s a fair and level playing field, I think, both countries are benefiting. So I don’t think the answer is either extreme. I think America has benefited from trade historically and will continue to benefit and I think it’s important that every country plays by the same rules. I’d like to know more about your immigrant parents’ journey to the U.S. because I think it would help readers to understand who you are. What part of India did your parents come from and where did they settle. They came from New Delhi straight to Baton Rouge where they’ve lived the majority of their lives. They came so that my mom could go to LSU. My mom was pregnant with me when she came over in the beginning of 1971. She was doing her graduate degree in nuclear physics. My father’s a civil engineer. I was born in Baton Rouge and they still live there. They literally came as a young married couple and spent almost their entire lives there in that city. My grandparents all lived in India when I was growing up. Certainly when I was younger we used to go there quite often, especially when they were alive to see them. My mom still has family in India so I’ve got cousins there. My parents had just come over so I think India impacted their life and certainly impacted my life, in terms of food, in terms of culture, in terms of growing up, that was a very important part of my life, growing up. I’m curious about that. Immigrants who come now to places like New York have it easy. What was it like being brown skinned and growing up in the South? Where did you place yourself on the landscape? I found it to be a very welcoming environment. I certainly never felt anything other than welcomed at school and on the playground and among friends. Baton Rouge is a university town because of the large size of LSU in the city so it’s a very diverse population. There are people from all over the country, all over the world. So even the neighborhoods I grew up in and the schools I attended tended to be very diverse. Were there many South Asian families around when you were growing up? It’s not a large population like you’d find in Houston or New York, but certainly there were several families, in large part because of the university or other reasons. There were several families in Baton Rouge and there were even more in New Orleans where my wife grew up. When did you discover your Christian faith? It was in high school. I was a teenager and my grandfather had passed away. It was really the first time I had thought about life and what happens after death and the importance of religious beliefs. I had always been raised to believe in God and to pray to God, but I felt like this was how God was calling me to worship Him. It happened about the third or fourth year of high school, when I was 14 or 15 years old. Your parents must be Hindu. Were they very religious Hindus who went to the temple regularly? And how did they take your conversion to Christianity? My parents are still Hindu. There was not a temple in Baton Rouge when I was growing up; there are now, two, maybe even three. They went to pujas fairly regularly. They tended to be in people’s homes as opposed to in a formal temple. But you felt the Christian faith answered the questions you had basically? Yes, yes. My parents were very supportive. They felt like it was important that I was embracing God. I think it would have been harder for them if I had come home and said I did not believe in God. They’ve always believed in God so I think it was just important for them that I continue to believe in God and pray to God. Was it difficult to explain your faith to other members of the community? No. I think most people respect that as a personal decision, something that was between me and God, and something that they respected. How did you meet your wife Supriya? We actually went to high school together. We did not start dating till about ten years afterwards. We had not stayed in touch and met again when she was working in New Orleans and I came back to Baton Rouge to head the health care department. What’s a typical day for you and your family? I know it’s going to change very soon, but right now there must be a lot of night feeds! In the morning I’ll check emails as well as look at the newspapers. I get to the office by 8.30 and work through the day. I try to get home by 9 p.m. so I can see my daughter before she goes to bed. I’m generally the one that puts her to bed. Her mom will feed her dinner and I will try to give her a bath and get her in bed, and read a couple of stories to her. Our son still gets up every few hours. My wife generally does most of those responsibilities. And then we start all over the next morning. What are your leisure activities, if you have any leisure, that is! Right now, whenever I get time off the campaign trail, I try to spend it with my kids. Before I campaigned for office, I used to play tennis, liked to read, liked to travel, but nowadays I’m either on the campaign trail or I spend the time with my family. Now that you’re headed for Washington, will the family be going with you or will you be commuting? I’ll commute. They’ll stay here and I’ll fly back and forth literally every week. I’ll be back in the district, back at home three-four days a week. So you basically spend a lot of time on airplanes. What suggestions do you have for Indian immigrants to become part of America? What should they be doing? I think it’s very important that Indians get involved in policy and politics. In many areas Indians tend to be very successful, in business, in academics, in medicine, and I think that’s a wonderful thing. The community has been diverse, successful, and everybody’s going to choose a different path. I don’t think people should feel like there’s only one way to succeed or make a contribution or live their lives here. I think the great thing about our community is that there’s so much diversity and people are making their own decisions and I would just encourage people to get involved in whatever they like to do. It may not be politics, it may be media, it may be business, it may be medicine. The great thing is because of the examples before us we really have been shown that we can do anything we want in this country. I think it’s a great opportunity. Also with the new generation, people are getting into policy making. An earlier immigrant might not have the chance to do that. It’s a wonderful thing, the diversity in the community. It makes sense when you look at other immigrant communities that have come here. They start by securing their academic and economic future for their families but after they do that, you see those other immigrant communities become more involved with a greater array of things. I think that’s happening with the Indian American community. So it’s a very positive and very natural development. What gets you through your day, through good times, bad times? Well, my kids are very important to me, my family is very important to me. To me, that reminds me why I’m doing this, why I want to be involved, because I want them to have a better quality of life, I want them to pursue whatever their dreams are. That makes it worthwhile for me, to make all these sacrifices. And also it must be your faith too, your Christian faith which gets you through? Absolutely. I think this idea that we’re all connected and have to care for each other is a very important aspect. Anybody who has a strong religious belief has this belief that life is more important than titles or toys, but rather we were created for a purpose so we should try to fulfill that purpose. With your qualifications, you could have gone into any profession and probably become a multimillionaire. So why did you choose public service and why does it bring you so much satisfaction. I feel it’s where I feel personally fulfilled. My parents, again, they have done very well. By coming to this country, I think they’ve always felt we owed the community, we need to give something back. It’s not just enough to make the most money or get the most titles, it’s important to do something that improves the community around you. So that’s always been a very important consideration of my family. My parents have raised us with that ethic, that importance of not only helping the less fortunate but helping by giving back to the greater community, and this is my way of doing that. For me, it’s personally very fulfilling. Especially if you can do something in healthcare, where the maximum number of people will benefit from that. That’s right. I originally thought I was going into medicine, but then I realized that if I went into health policy I could help make the system better for several doctors and therefore help several more patients than I could have if I just went into medicine itself. Obviously it’s much more of an indirect satisfaction. Doctors directly heal people. I won’t be doing that, but hopefully if I do my job right I can impact even more people, even if it is indirectly. There is a perception among many in the Indian community that you converted to Christianity and adopted extreme conservative views to make yourself palatable to the Republican establishment in Louisiana. How do you respond to such critics? My own views on faith and values have been shaped over the years by a variety of relationships and experiences. Like many people, while I was raised in a household of faith, I took a rather carefree attitude toward matters of religion in my early years, not paying much attention to spiritual things. It was not until my grandfather died that I began to seriously consider the questions of life, death, and the possibility of life after death. My best friend growing up had the courage of his convictions, and the courage to talk to me about his faith in Christ. He gave me a Bible for Christmas. I thanked him for the Bible but promptly laid it aside to gather dust. Later, after hearing the testimony of yet another friend, I decided to search the scriptures, almost as if I was trying to do some investigative reporting. A youth minister played a critical role in answering my many questions. As I hreflected on the scriptures, I knew that I had a decision to make, and I made it. As I made my profession of faith, I felt an assurance of my destiny and an understanding of the love of God. Today, my faith in Jesus Christ is central to who I am, and I pray regularly for God’s wisdom in all the parts of my life. The conventional wisdom is that the Republican Party is not hospitable to minorities and immigrants. Why were you attracted to the GOP and does the criticism of the party have any validity in your opinion. My allegiance to the Republican Party has everything to do with the core values at the center of the party. The Republican Party believes in the value and freedom of all individuals. It believes in less government in our lives, not more. It stands for lower taxes, less spending and less government control of our health care systems. The Republican Party also represents the conservative values that Louisiana residents find most important in their lives. The Republican Party wants every individual to work toward and achieve his own American Dream. You rose through the ranks in Louisiana politic and had little name recognition within the Indian community until you ran for governor. Do you see yourself playing a role in the politics of the community and do you think the community should cultivate political leadership rooted in the community, such as Jesse Jackson is perceived to speak for the African American community. I look at my success this year as the ultimate embodiment of the American Dream. I owe my victory to the voters in the 1st District who have trusted me to work for them, the volunteers who literally worked around the clock to get our message out, and most of all to this country of opportunities. This is a country of opportunities where people are judged on their ability and their performance. I think that is very important. What makes the American system so successful is the fact that immigrants and their children can do very well here with hard work. I think we all follow those who came before us, and we are certainly grateful for the example Congressman Saund and others have established for us. I am building on those who came before me, and many more, certainly will come after me. I truly hope many more Indian Americans will begin to work in appointed and elected positions. I think we are a large diverse community that has a lot to offer, and it makes sense that as many people as possible do participate.